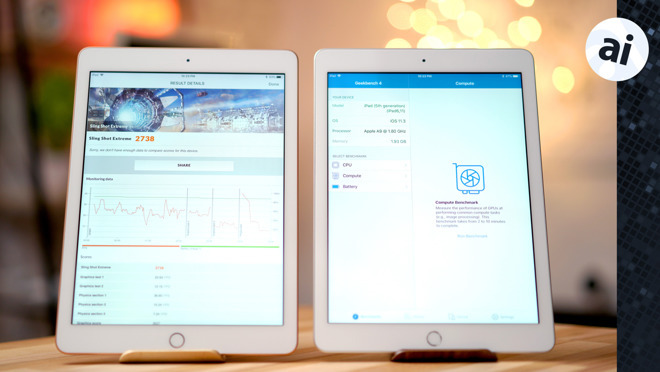 We're taking a hands-on look at Apple's new sixth-generation $329 iPad and comparing it to last year's model, complete with benchmark scores. Here at AppleInsider, we just got our hands on Apple's new 2018 budget iPad. Like last year's model, it's only $329, but this time, it's available in gold. Other than that, the exterior is literally identical to the old one. On the inside, the processor has been upgraded to Apple's A10 Fusion chip, which came with the iPhone 7 and 7 Plus. To see how it compares to the A9 chip in last years iPad, let's take a look at benchmarks. In Geekbench 4's single core test, the new iPad was 44 percent faster. Multi-core showed even more improvement with a 53 percent better score. For the GPU test, there wasn't as big of a difference, but the new iPad was still 23 percent faster. Running Antutu's benchmark, the 2018 iPad scored around 38 percent higher than the previous model. We saw exactly the same results in 3D Mark's Slingshot Extreme benchmark, with a 38 percent better score. Moving onto browser benchmarks, the 2018 iPad scored a hefty 45 percent higher in Octane 2.0. We also ran Antutu's HTML5 benchmark and saw a 22 percent better score compared to the old iPad. One thing we noticed is that the 2017 iPad would lag behind in some of the benchmarks even though we started them at the exact same time. For being priced exactly the same as last year's model, the new 2018 iPad definitely blows the old one out of the water in terms of performance. Games and augmented reality apps should definitely run a lot smoother, and even the whole UI in general feels a lot snappier than before. On top of that, you get Apple Pencil support on the new iPad, which you couldn't previously get without buying an iPad Pro, which costs a minimum of $649. We've got to hand it to Apple for offering such an awesome iPad for such a cheap price. Don't forget to subscribe to our YouTube channel for more iPad comparisons coming soon. Have you purchased the new 2018 iPad? Let us know your thoughts in the comments section below. Looking to purchase a new iPad? Apple authorized resellers are accepting orders with added tax incentives for many. Both Adorama and B&H will not collect sales tax on orders shipped outside NY and NJ, but B&H may report sales in CO and VT*. Both retailers are also offering shoppers free shipping in the contiguous U.S. For a full list of deals and product availability, please visit our 2018 iPad Price Guide. Those looking for a bargain on a 2017 iPad can also save up to $60 on last-gen models, according to our 2017 9.7-inch iPad Price Guide.